Click HERE to sign up for Spring/Summer Registration. There is a potential weather event this afternoon/evening that could close county facilities for after school activities. A decision will be made early afternoon. If closed, practice will be cancelled. If not, practice will continue as scheduled though attendance is at your discretion. Due the nearly TC only pool at the Washington College in December, we were able to acquired an additional tournament the weekend of the 5th/6th for the U12's. We realize this is short notice but slots were formalized today. U12 Blue and U12 Black will play on 1/5/19 and U12 White will play on 1/6/19. We will distribute the schedule in the next day or two. If you have not already done so, please print out and fill-out, the linked WAIVER for Washington College (Peak Field Hockey) so that you have it with you to give to your coach as soon as you arrive to the tournament. Unless otherwise stated by the coach, please plan on arriving NLT 45 minutes ahead of the first scheduled game. Note: Only 1 waiver per venue is required each season. 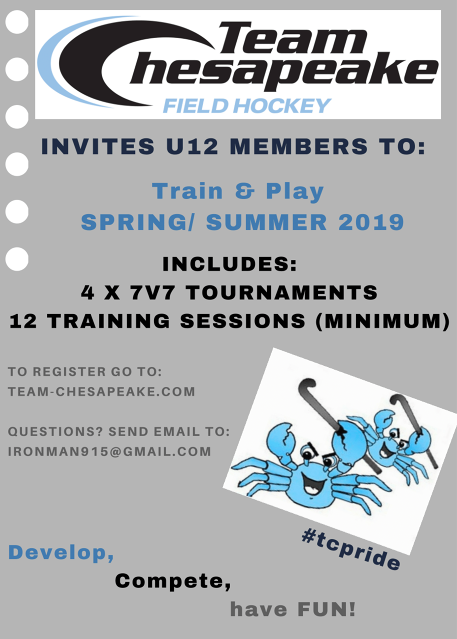 Team Chesapeake is a regional field hockey club centered in Kent Island, Maryland. The club is comprised of fifteen teams for girls aged 8 to 18. 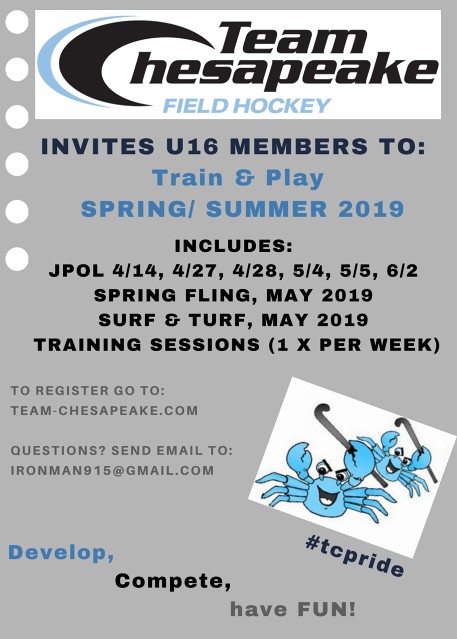 We are dedicated to providing an opportunity for girls to develop field hockey skills, experience top level competition, and have fun! The 2018/19 indoor field hockey season rosters are posted on our web page. You can find the rosters at the following link: https://www.leaguelineup.com/teams_hockey.asp?url=team-chesapeake. You must have a League Lineup Account to view the rosters. There are roll bars at the top to select age group and team. We appreciate your patience as we implemented the new selection process. Having the extra time to think through placements has been invaluable to curate strong team units for the season ahead. We are very proud of our coaching and management staff in completing this work. They take this work very seriously and put in a great deal of time, energy and focus into doing it. Going forward we will continue with our collaborative-coaching approach. We feel this unified system is effective at developing the strengths of the individual players as well as the teams. 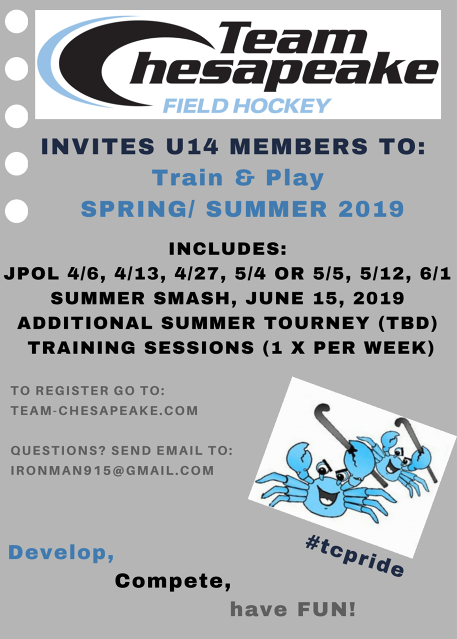 We are confident in our coaches ability to help Team Chesapeake players advance while supporting our overall vision to develop, compete and have fun. We are looking forward to exciting and competitive performances by all our hard working players and coaches this weekend. We were able to secure weekend make up dates for the practice we missed last week. Here is the practice schedule for the weekend. This weekend will be a little different than normal so note the time changes. We will be passing out uniforms ordered this weekend at practice. Please make plans to attend if you ordered a uniform. If you cannot attend please reach out to to make arrangements to come pick up your uniform in Centreville next week. Remember, you will need navy blue and white sleeves for all games. Spirit Wear... all orders are in. If your order is intended to be a secret and maybe a holiday present, please make plans to pick up your order at All American on Kent Island BEFORE Thursday Dec 13. All orders NOT picked up by then will be delivered to the player at the Dec 20th Practice. Any questions, please reach out to me directly at 410-829-6389. Practice is cancelled tonight due to traffic related to bridge accident. Please get the word out. Bay Bridge authorities have informed that there is a west bound bridge closure currently. That will create backups on roads we use to get to practice at Bayside. Please adjust your travel plans accordingly. Overturned tractor trailer just prior to the westbound span of the Bay Bridge. Currently, two-way operations (during which one lane of eastbound traffic is directed to the westbound span) in place on the eastbound span. Crews are working to upright the vehicle and clear the scene. Drivers may experience delays during this afternoon's rush-hour period. For the most up-to-date information follow us on Twitter at TheMDTA or call 1-877-BAYSPAN (229-7726) for current traffic conditions. The Practice and Tournament Schedule updated with the latest information. Select "Schedule" from the menu bar above then in the drop down pick "Calendar". Thank you ALL for joining us at the parent/player meeting this past Thursday. What a great display of commitment and enthusiasm, characteristics that will be critical in our ability to provide a wonderful experience to all members and implement our club program philosophy and aspirations as we continue to evolve. We also appreciate your patience in supporting many logistical aspects that relate to ensuring effective planning, organizing and management of all athletes, families, coaches, and administration. We are excited to kick off training this week and wanted to be sure that everyone was prepared with the necessary information. Please arrive 15 min before your scheduled start time for warm up and preparation. If your age division is scheduled for the first training session, please support board / goals set up with the coaches. If your age division is scheduled last, please help break down and store equipment. We will be posting more practice and tournament schedule information in the next few days. Goalies, please let me know if you need to borrow a kit and provide an approximate size. REGISTER PRIOR TO THURSDAY'S Training. Registration link is here. Many player memberships will expire in the next month or two. Please update your USAFH membership to cover the season. PAYMENTS need to be turned in to Nicole Brittingham or I by Thursday. We will be located near the gym entrance during practice. 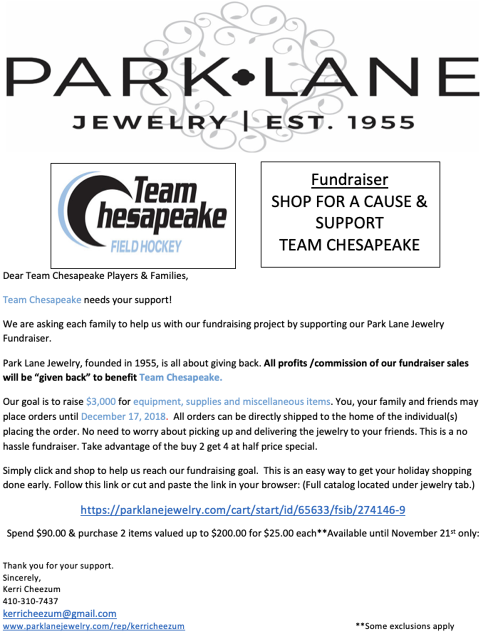 The Team Chesapeake online store can be found here if you are interested in club gear. Thanks and let the Player Development, Competition, FUN! begin! Now that we have uniforms behind us, it’s time for spirit wear. We have an extensive selection of Team Chesapeake spirit wear on line at All American. From T-shirts to long sleeve. Sweat shirts to jackets...we have a lot to choose from. It is open now and will remain open until November 24th. We will have our orders back in time for the holidays. It’s a great Christmas present! We will deliver all orders to the last practice before holiday break. Or you can always pick up at All American on Kent Island directly. We will be hosting a meeting for parents and players at the Bayside Elementary gym on November 8th at 6:30pm till 7:30pm. We will be discussing pertinent information about the upcoming season and provide a chance to meet the coaches. Make plans to join us. Rec games have been cancelled at Worton Park today and as such our uniform sizing session is cancelled. We are rescheduling for Sunday 10/28 from 1-2 at Centreville Food Lion in the parking lot. Please contact Leslie Ray if you have questions or issues regarding uniforms. Please complete registration. We need all players to be in the system by start of practice Thursday 11/8. The link is on the top right of the home page below the banner. Hopefully most have gotten to one of our two sizing events. We have one more this coming Saturday. I am changing the location due to some commitments. This Saturday... we will have the sample uniforms to try on at Wharton Park in Chestertown from 1p-4p. Find Shana in between games and she can help you. We will NOT be at Kent Island Food Lion location as originally scheduled. Also... you can come to my house or call me and I’ll help. We need all uniforms ordered online by Monday Oct 29 at noon. The online store is up and fully running now. A few items were added late, sorry about that. See below on the specifics. Please don’t hesitate to text me if you have a question. Each player will be responsible for ordering/paying for their own uniform. For U12,14,16,19…each uniform will consist of (2) jerseys; (1) skirt. For U10… each uniform will consist of (1) reversible jersey. Socks – each player is responsible for purchasing sleeves – navy blue and white. 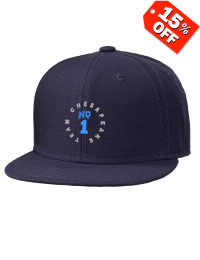 These can be purchased at any sporting goods store or online, such as Amazon. Each uniform MUST be ordered no later than October 29 at 12:00PM. NO EXCEPTIONS! Anyone who doesn’t place an order by then will not be allowed to play as we will be unable to order another uniform for 4-6 weeks, which would be the end of the season, so it’s imperative that you place your order by October 29th. You will be assigned a number. If you already have a uniform and it fits, you’re all set; we don’t anticipate any number changes if you move up into another age group. I will have 3 sizing opportunities before the deadline. 4) You can always come by my house in Centreville, or I can try and meet you somewhere – we will get you sized in time, don’t worry! Messages for tryout results have been sent to all players as of 10/14 at 8:30pm. Check your spam folder if you didn't get a message. If you still have no message, please email Paul Masucci at ironman915@gmail.com and i'll get you a response message directly. Responses are due by 10/20/18. Please be prompt.